High Quality Foam � Beveled Edges for Smooth & Safe Performance! 6 1/4" x 1 1/4" Pads - Perfect Size for Flex DA Polisher Control! 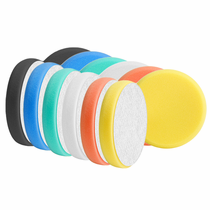 Buff & Shine 6.25" Flat Faced DA Foam Grip Pad� Mix & Match 6 Pack gives you the choice of six pads to meet your polishing needs. Specifically designed for the ultimate ease of use and durability with all DA Polishers. Buff & Shine bevels both sides of the pads. This allows for smooth user control on curved body panels, easy pad centering and safety when polishing near edges. Flat pad surface assures even polishing coverage. Consistent high quality foam measures 6 1/4" x 1 1/4". Machine Washable!